Indonesia has issued a 14-day state of emergency to cope with the heavy consequences of flash floods and landslide triggered by torrential rain in the eastern province of Papua, as fatalities have climbed to 77 on March 18. According to the disaster agency, 43 are still missing while scores have suffered from injuries in the flood. 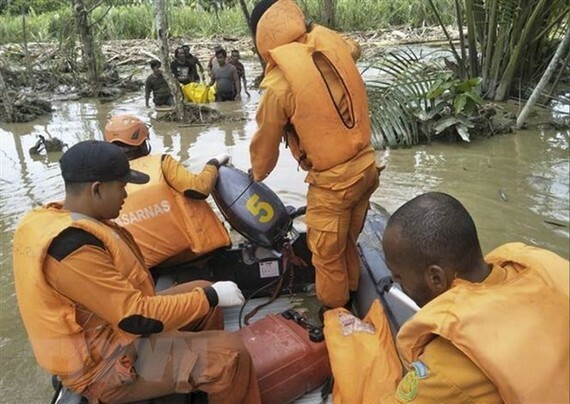 Rescue forces are struggling to search for survivors under heaps of mud, soil and fallen trees. The military said 5,700 people had been evacuated from the worst hit areas. Floods are common in Indonesia during the rainy season which lasts from October to next year’s April. Last January, floods and landslides in Sulawesi claimed at least 70 lives. Also on March 18, three tourists, including two Malaysians, were killed at the Tiu Kelep tourist site in Lombok island in a landslide triggered by an earth quake. Dozens of others were injured in the disaster. Lombok is carrying out reconstruction work after a series of quakes and aftershocks killed more than 500 people and caused damage worth US$528 million last year.